Remember this? 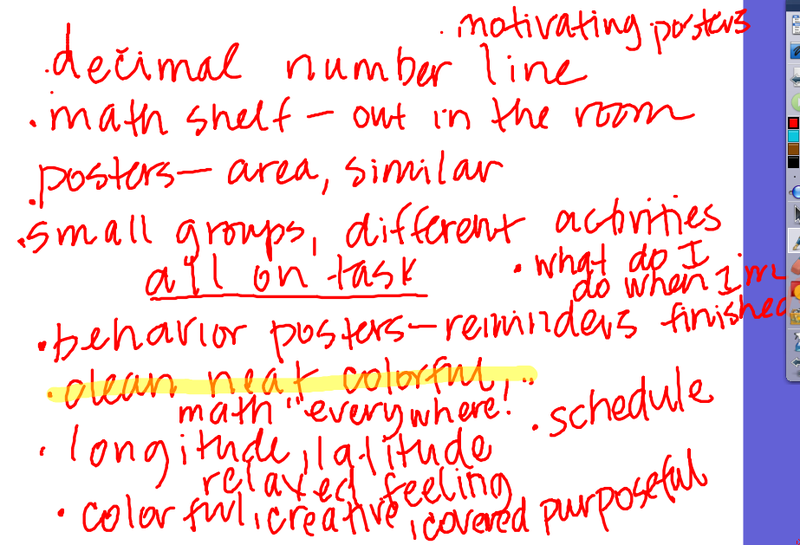 Since then we’ve done several other math warmups about geometry and decimals. But we’ve also been doing some other things–things that started out with math and quickly spread to other areas of our life together in Rm. 201. The other day I asked my kiddos a question, and after I did, I realized–by listening to the crickets and seeing their confused faces–that they didn’t get it. So I rephrased it, and also took them on a little tour to help explain what I meant. One of the things I’m working on is making our room look and feel like it’s as much a place for mathematicians as it is for readers, writers, and scientists. So I took them to a place that I knew would help them get a feel for what that looks like–our neighbor next door, Mrs. LeSeure’s 5th grade class. We sneaked in very quietly and looked around. The directions were to pay attention to what they saw that told them that math happened in that room, things that maybe they didn’t see in our own classroom. We then came back and brainstormed what we noticed. What was really great about what they put on the list was that they noticed things that I know that Pam specifically did for her math environment, but they also caught on to the things about how the room felt, the subliminal messages that were being sent in that space. As you can see on our chart, Mrs. LeSeure’s class has things that help her students in math, like anchor charts from things they’ve just learned about, like area/perimeter and the difference between similar and congruent, both from our recent 2D geometry unit. But my students also talked about how her classroom felt. They said that it felt relaxed. It was clean and neat and colorful. This was where I had to be brave. I had to remember that just because they said her room was like that didn’t mean that ours wasn’t, or that I am a bad teacher, or that her class is better than ours. It just meant that Rm. 202 had some things that ours doesn’t have, different things. Things that we want to add to our own room. Most of what they were saying actually went way beyond the original math-related question I asked. They went deep. And they made me nervous. But like I said, I had to be brave. Their statements dug deep to the reasons why some things happen in our room, the reasons why we sometimes struggle with paying attention and why it seems like we don’t know what to do next, or why we waste our learning time. They were really great comments, actually, and come down to the fact that our room just really isn’t working for us anymore. That was the part I had to be brave about–I am, after all, the one who designed that room, and created the environment in the first place. Remember when I showed you what it looked like the first time I came in during the summer? And then how it started to change as I put it together? Well, even since then, many things have changed since we first started together in August. But on Wednesday we were talking again about how more change needed to be made. I loved how Evan put it when he said, “I don’t mean to be mean, but you arranged the room without us, and we’re the ones who spend the most time here.” And you know what? He’s totally right! It’s really funny how that whole thing works, really, with the teacher planning and arranging and setting up the room for a group of kiddos she doesn’t even know yet, without their input. I know it’s just what has to be done, but it would make sense that the people spend all that time and energy there every day should have some say in how it looks. And feels. So that’s when it happened. I gave them a chance to suggest changes they thought should be made. I asked them to tell me, and to even draw a map if they wanted to, what they thought about what we could take out and what we needed to move. Everyone got busy, some by themselves and some in pairs or small groups, making lists and floor plans to help us all see the vision of what we could do. It was so very cool to “see” the classroom through so many new sets of eyes. I obviously look at and pay attention to different things than my students do as I go through the learning day. It was also really cool how similar their maps were when we sat down to look at them. For example, there at least 3 different groups who suggested that our classroom library move to another part of our room (a place where I originally was going to put it, actually, but then changed my mind about) and how everyone agreed that the cubbies as a divider between the carpet and Table 3 just didn’t work. Most of them had the same idea for how “my” area could change, by turning my desk 90 degrees and putting my computer in a different place. And I appreciated how they used their new geometry vocabulary to explain it to me! So I began that very afternoon to make some of the changes that they suggested. And you know what? IT LOOKS AMAZING! These kiddos are so darn smart about what they need and what works for them as learners. They teach me every day, in a respectful and appropriate way, that I don’t know everything! The room has taken on a new and different feel, and most people who have come in have commented on how they like what’s happening. We’re not quite done yet, but believe me, I’ll definitely show it to you when we’re finished. I’m really pretty excited about it. And they are, too. I love how many kiddos said to me how much they appreciated that they have a say in this. I’m glad I gave them a say, too. Because they are saying some pretty great things. How do you make decisions about your room/environment? When have you had to be brave? What ideas do you have for us as we work on the environment of numeracy (and literacy and so on…) in our classroom? Posted on February 4, 2012 by Jen Bearden	• This entry was posted in Classroom, Math, Uncategorized and tagged changes, classroom, community, floor plans, fun, lessons, math, possibilities, redecorating. Bookmark the permalink.